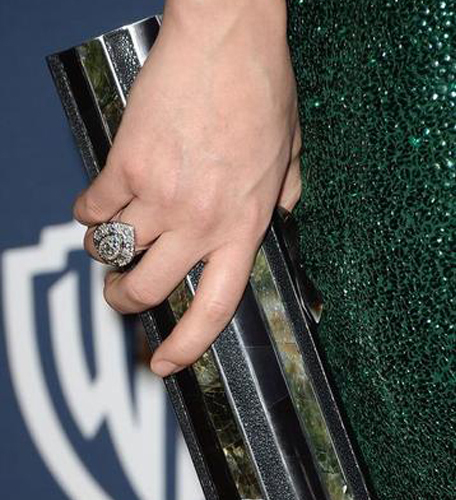 When it comes to Hollywood awards, no red carpet look is complete without diamonds. From magnificent diamond rings and bracelets to vintage diamond necklaces and head-turning diamond chandelier earrings – stars sparkled at the 71st Golden Globes Awards, held on Sunday 12 January 2014. We take a look at some of the best dressed celebrities and their dazzling diamonds at this year’s awards. Dressed to perfection in a black lace Armani Prive gown, actress Cate Blanchette wore 11ct marquise cut diamond earrings to collect her award for the Best Actress in a Motion Picture for her performamce as Jeanette “Jasmine” Francis in the American drama film, Blue Jasmine. Actress Jessica Chastain’s jaw-dropping diamond and platinum vintage diamond necklace dates back to the 1930s, glamorising the Golden Globes as she presented the award for Best Actor in a Motion Picture. Margot Robbie of “Wolf of Wall Street” added extra sparkle to her glamorous Gucci gown with Snowflake motif diamond earrings and a diamond ring. The American Hustle actress wore $2.5million worth of sparkling jewels, including a platinum diamond ring and a stack of black and white diamond bracelets to compliment her black and white Dior gown as she accepted the award for Best Supporting Performance in a Motion Picture. Actress Amy Adams was red hot in $8million worth of jewels, including asscher-cut diamond earrings set in yellow gold and a magnificent 30ct diamond pendant in the centre of her plunging Valentino gown, earning a Golden Globe in the category Best Performance in a Motion Picture for her role as Sydney Prosser in American Hustle. E!’s Guiliana Rancic wore $3million worth of diamonds including a jaw-dropping 14ct diamond oval cut ring, which she wore on her middle finger of her right hand. Actress, Comedienne and Muscian, Allison Williams opted for a statement diamond ring and a pair of onyx earrings to illuminate her dazzling diamond bracelet. You could not miss Kate on the red carpet as she sparkled from head to toe with her metallic Zuhair Murad gown covered in sequins, and a pair of 7ct black and white diamond earrings to finish off the look. Pregnant actress Olivia Wilde looked glamorous in her green Gucci gown complete with a 3.90tcw diamond and pave marquise ring with round brilliant diamonds set in 18k white gold. Uma Thurman complemented her elegant black dress with a pair of 22ct chandelier diamond earrings and a platinum bracelet featuring a 40ct asscher-cut diamond to present the best award for Best TV Series.